, whether of the same family with the preceding we know not, for Wood says he was a Frenchman born, and called Thoris, became a physician and Latin poet, and admired in both characters in the reign of James I. 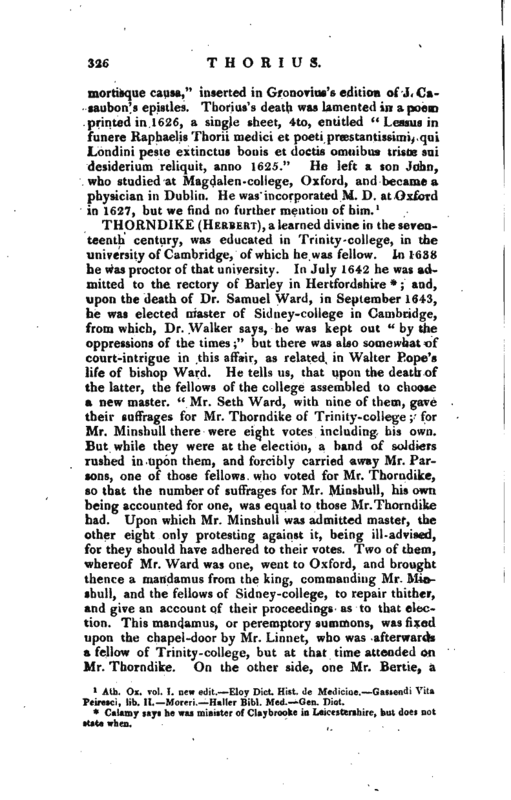 He appears to have studied medicine at Oxford, but took no degree in that faculty. He afterwards settled in London, and was very successful in practice. In the first year of the reign of Charles I. when the plague raged in London, his humanity led him to expose himself too much to the infection, and he died of that dreadful disorder in July or August 1625, and was probably buried in St. Bennet Fink church, as his residence was in that parish. 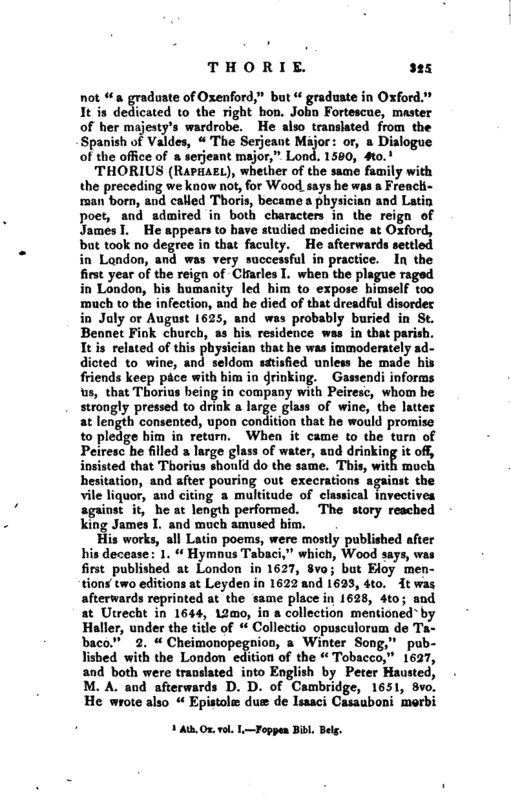 It is related of this physician that he was immoderately addicted to wine, and seldom satisfied unless he made his friends keep pace with him in drinking. Gassendi informs us, that Thorius being in company with Peiresc, whom he strongly pressed to drink a large glass of wine, the latter at length consented, upon condition that he would promise to pledge him in return. When it came to the turn of Peiresc he filled a large glass of water, and drinking it off, insisted that Thorius should do the same. This, with much hesitation, and after pouring out execrations against the vile liquor, and citing a multitude of classical invectives against it, he at length performed. The story reached king James I. and much amused him. Ath. Ox. vol. I. new edit.—Eloy —Dict. Hist. de Medicine.—Gassendi Vita Peiresci, lib. II.—Moreri.—Haller Bibl. Med.—Gen. Dict.